As we move into our fifth and penultimate month with the Audi A6, we have hit a new high for fuel efficiency. On a 112-mile trip back from Heathrow Airport, we topped 60mpg for the first time – 61.2mpg to be precise – helped by several sections of 50mph contraflow on the motorway. Compared to the official combined correlated NEDC figure of 62.8mpg, that’s a solid performance, and is comfortably above the WLTP figure of 47.1 - 50.4. Interestingly, this level of consumption was achieved with no attempt at efficient driving; just keeping to speed limits and my natural style. I suspect the car has even more to give, with a feather right foot. Nevertheless, over the duration of the test, efficiency has averaged in the 50s, according to the detailed on-board computer. It is easily accessible within the expansion multimedia system which, while slow to launch first thing (see February review below), is an outstanding piece of connected technology. It can be configured for personal use to remember your preferences. 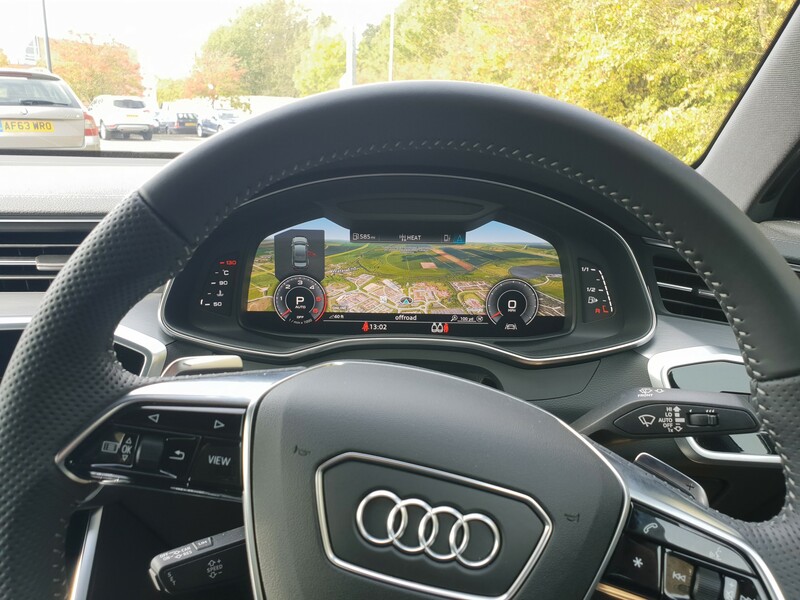 The sat-nav, featuring Google Maps satellite images, is clear with accurate traffic jam warnings and addresses can be inputted by keyboard or by drawing the letters with a finger on the lower screen. The latter – only accessible when the car is static – can be problematic when the system tries to distinguish between Z and 2, and O/0; default position is the letter, even in a postcode. Journey times are precise and the directions clear, with options to replicate the map on the driver’s binocle (Virtual Cockpit) to minimise the time your eyes are off the road. 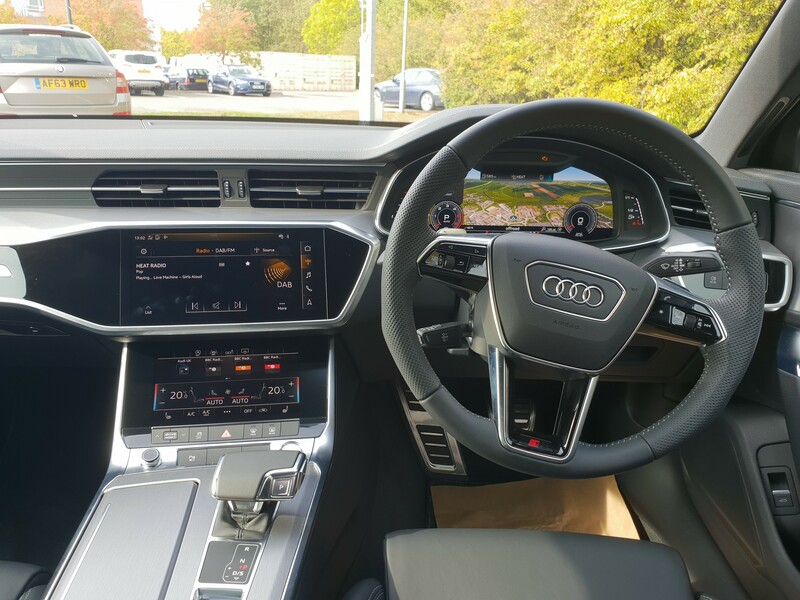 Everything is accessed via touchscreen or controls on the steering wheel, for maximum ease of use resulting in clean and pleasing design aesthetics. Following our criticism of the Audi A6 auto transmission’s reaction time, we were told by a major leasing company that Audi had developed a software fix for the 2019 model-year car. However, according to Audi, this isn’t the case. That’s a shame, because the hesitation suffered by the seven-speed ’box detracts hugely from the driving experience. It can take fully three seconds to engage reverse and a second or so to find first gear when pressing the accelerator after stop/start, which doesn’t inspire confidence when trying to pull out into traffic. The solution? Slot the car into dynamic mode and the reaction is more instantaneous. And once underway, the dual-clutch is rapid and seamless through the gears. There are other issues of sluggishness, though. The windscreen takes an age to demist while the multi-media system can take 10 seconds or more to burst into life; these things are irksome for everyday use, especially on a premium car. Four months in and we now have a good feel for the A6. Handling that initially felt light and remote is actually pretty accurate, predictable and direct – particularly in dynamic mode – and we’re now used to the limited feedback, despite the S Line’s sports suspension. The A6 is grippy and nimble, enabling you to push hard with complete confidence in its performance. We’ve learned to trust the technology and, while it isn’t a class-leader in pure driving enjoyment, the A6 delivers a decent experience with comfort and relaxation taking front stage. And, the light touch is perfect when manoeuvring the large car around city streets. Definitely worth considering within a competitive set, even with a few foibles – all of which could be ironed out with a bit of software investment and a rapid-clear heated windscreen. The Audi A6 sits in the middle of the executive pack when it comes to real-world fuel efficiency. On a 17-mile commute, it can nudge 50mpg, while on longer journeys, mid-50s is well within reach (official figure is 62.8mpg). That’s similar to the Mercedes-Benz E-Class, better than the BMW 5 Series (mid-40s on commute, low-50s on long journeys), but below the Jaguar XF (low-50s/high-50s). Note, it’s a 2.0-litre diesel. 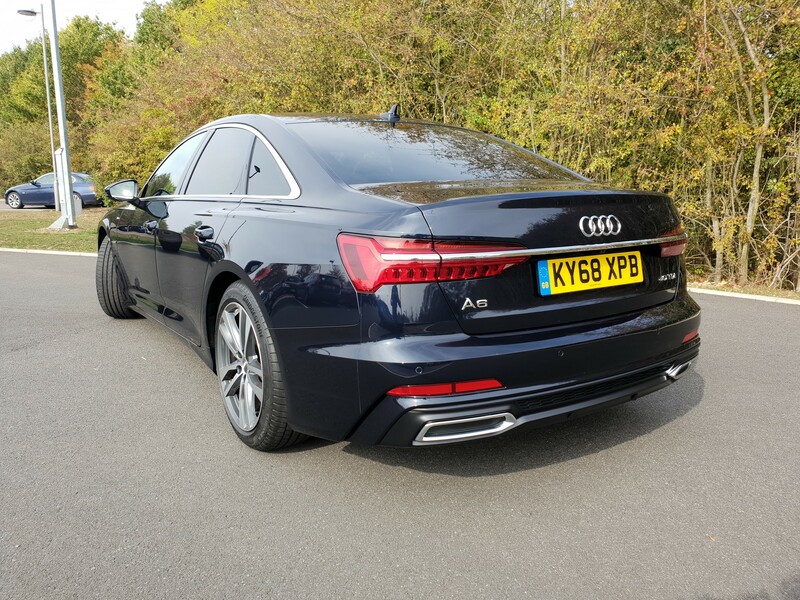 Every acquaintance has been fooled into thinking the A6 is carrying a mighty 4.0-litre engine by the badge on the back: 40 TDI. Audi’s new naming structure is great if you want people thinking you are driving a supercar-bothering executive model, rather than the entry level engine, but not so good in today’s emissions and air quality-fixated society. 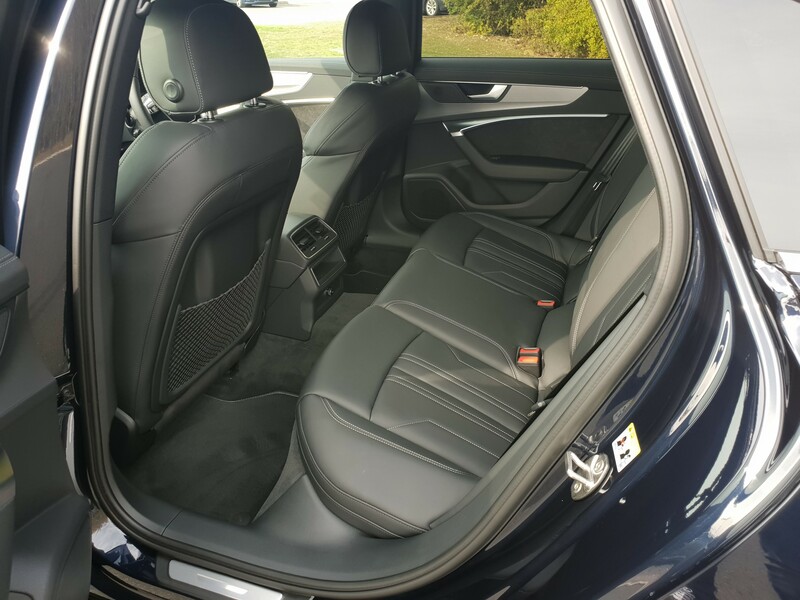 Likes over the past month: the 40/20/40 split-folding seats have come in useful for part-loading with family on board (and they are standard-fit, unlike on the 5 Series and E-Class). 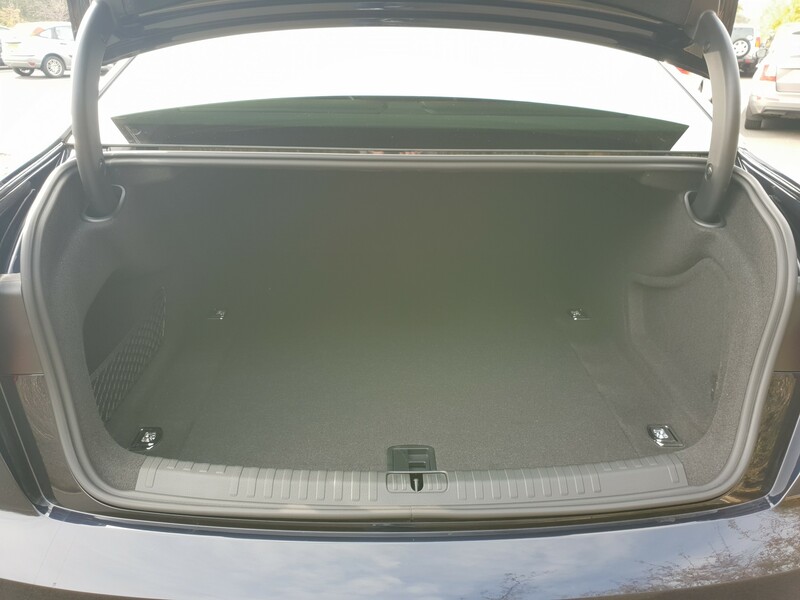 As the miles have built, the spacious interior and comfortable seats have been welcomed by passengers while the huge boot space (530 litres, bigger than some estates) came into its own over the Christmas period. The A6 is smooth and effortless to drive, making it an ideal companion over those longer distances. It’s not the sportiest, but we’ll look at driving impressions in the next review. One feature I’ve recently discovered is remote window operation. After locking the car and walking to my house one evening, I accidently pressed the key fob while fumbling for my house keys. Cue whirring sounds as all four windows wound down. Apparently ‘convenience window’ is something Audi (among others) has offered for a few years. While I have managed to make it through 30 years of driving without ever needing the function, if you press and hold the lock button, you can wind the windows up remotely, which is occasionally handy when you have two absent-minded children. A stand-out feature of the Audi A6 is its intelligent lighting, which we briefly mentioned in our first review. Audi has been investing heavily in lighting technology for many years and, as a result, it has the best systems around. The carmaker believes maximising available high beam at night will improve safety by improving visibility. Given that 40% of collisions occur at night – a time when road volume is at its lowest – the logic is sound. The system on the A6 features Audi Matrix technology. It uses information from multiple sources, including the interior mirror camera and navigation system, to identify the appropriate lighting configuration for the individual LEDs. This provides maximum and precise illumination without dazzling other road users. Individual lighting diodes are lit or dimmed as oncoming cars approach, or upon entering urban areas, in 64 stages, with several million possible patterns. As a result, a corridor of lights is illuminated around the object to maintain maximum visibility of the road and surrounding environment. It is fascinating to watch (ideally as a passenger as it can be a bit hypnotic) and seems to work perfectly, as the reaction to other traffic is instantaneous. Adding to the night-time visibility are the dynamic rear indicators which sweep from inside to out and help other road users to clearly see the direction in which it is turning. It’s clever stuff and makes night-time driving a pleasure. Also worth a mention (an excited friend insisted I tried them) are the fog lights – ‘all-weather lights’ in Audi-speak. They are integrated into the main light housing and provide better illumination than traditional fog lights, but with less glare. Another win for the Audi lighting engineers! I was preparing the last review of our Volvo S90 T8 when the opportunity came to test another car in this class, the new Audi A6. 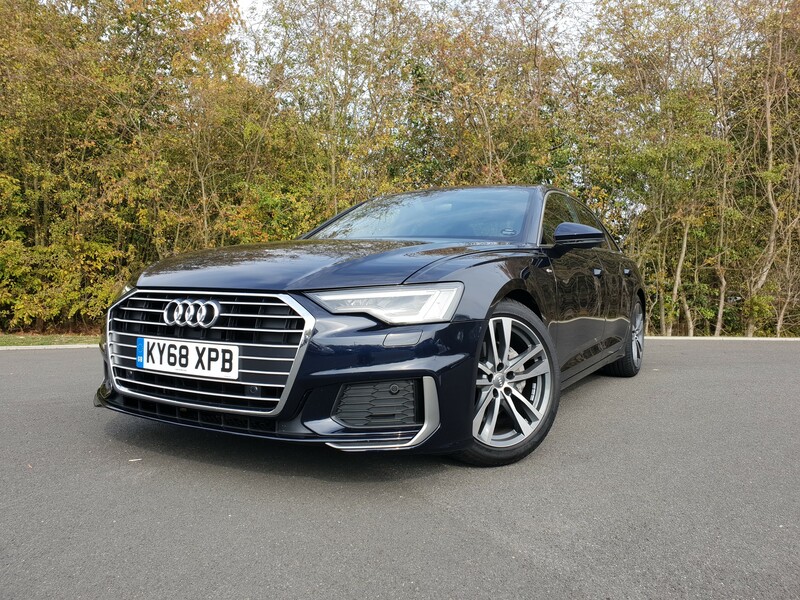 Having tested the BMW 5 Series, Jaguar XF and Mercedes-Benz E-Class within the past 12 months, the A6 offered a chance to complete the missing piece in the executive car jigsaw. My S90 review was due to focus on its performance, which is exceptional thanks to the added punch of the battery power. My comment was “the S90 explodes from standstill, hitting 62mph in just 4.8 seconds”. I mention this because the contrast with the Audi A6 could not be more striking. The A6 also packs a punch, thanks to its 204PS 2.0-litre diesel engine, but it’s not instantaneous like the S90. The transmission is lethargic from standstill and takes an age to engage, especially from stop/start and when selecting reverse. It feels like a couple of seconds pass before you get underway. Mid-gear, the DSG is seamless, but we’ll keep an eye on this in subsequent reviews. Our Audi A6 is the £41,110 40 S Line seven-speed S Tronic, with 62.8mpg and CO2 emissions of 117g/km. 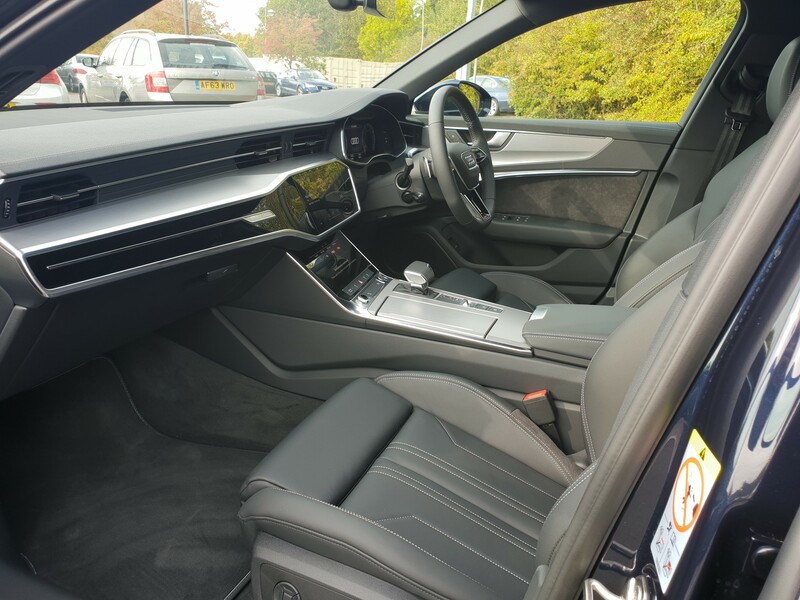 We’ve deliberately kept the optional equipment low to ensure the price is competitive, choosing only the £1,495 Technology Pack (eight-inch touchscreen display with Google 3D maps, seven-inch virtual cockpit, wireless phone charging). Audi added £475 privacy glass. The Tech Pack is well worth the money, with faultless topographical sat-nav and digital displays up with the best. Even better are the headlights, the finest we’ve experienced. Individual LED lights constantly flash on and off, reacting to oncoming traffic, pedestrians, bends and different road types to ensure maximum illumination of the route ahead without dazzling other road users. It’s intelligent technology at its best. First driving impressions are also excellent. The car feels agile and lighter than its BMW and Mercedes-Benz rivals, although the 5 Series arguably offers a better all-round driving experience (we’ll report back once more miles are on the clock). Initial impressions, then, are lots of positives, with some negatives. We’ll delve into these in more detail over the coming months. Mercedes-Benz E-Class offers fleets and drivers a compelling car which compares well with its rivals from both a cost and performance perspective.